Broke and the Bookish. Now I could come up with a few, of course I could, but the thing is, I know new books and mainstream reissues will go on being there, maybe not for ever but for long enough that I can pick them up when I’m ready. My true ‘must buy’ books are out of print and hard to find titles by authors I have come to love, and books I know I must seize as soon as I see, because if I don’t the chance may never come again. Oriel Malet: I spotted a book called Marraine by Oriel Malet in the library and I recognised her name from the Persephone list. That book was a lovely memoir of her godmother, the actress Yvonne Arnaud. Once I read it I had to order Margery Fleming from Persephone, and it was even lovelier; a perfectly executed fictional biography of a bookish child. Her other books are out of print and difficult to find, but I found one and I was thrilled when my Virago Secret Santa sent me another, all the way across the Atlantic. Margery Sharp: I read much praise for The Eye of Love in the Virago Modern Classics group on LibraryThing and so I picked up a copy. I loved it too – romance with a hint of satire and a hint of subversion. I was so disappointed that her other books were – and still are – out of print. But I’m slowly picking them up, used copies and library books, and I’m hoping for more. Leo Walmsley: Looking back, it’s strange to think that when I picked up Love in the Sun in the library it wasn’t with the intention of reading the book. I remembered a local family called Walmsley and I was simply looking to see if there was a connection. But once I had the book in my hand I fell in love with the cover and with a warm introduction by Daphne Du Maurier. And I fell in love with the book, thinly veiled autobiography written with such honesty and understanding. The library fiction reserve provided copies of the three that follow chronologically from this one. The Walmsley Society has recently bought these books back in to print, and others too, but I was thrilled when I stumbled across lovely old editions of Phantom Lobster and The Sound of the Sea. Angela Du Maurier: Talking of Daphne Du Maurier, did you know that her sister was a successful author too? I didn’t until I found two novels and one volume of autobiography that Truran Books have in print. It was the anecdote that gave the autobiography its title that made me love Angela – she was stopped by a woman she didn’t know who was convinced that she knew her. As she spoke Angela realised she had been mistaken for Daphne, and when she explained the woman said loudly to her companion, “It’s only the sister!” and stormed off. Angela treated the incident as a great joke, and though it wonderful that her sister was held in such regard. And she wrote of her family and her life with such love and enthusiasm that I had to look out for her other books. They’re out of print and its hard to find out much about them, but I liked the one I found in the library fiction reserve – The Frailty of Nature – and I’d love to find more. Edith Olivier: I had no idea who Edith Olivier was when I picked up my copy of The Love-Child, but it was a green Virago Modern Classic and I have great faith in those. It is a wonderful tale of an imaginary friend, and I’m afraid I really can’t find the words to do it justice. The library gave me a two wonderful works of non fiction, and there are some diaries I plan to borrow one day, but I would love to find another novel. Sadly though, they seem as rare of hen’s teeth. Elizabeth Goudge: My mother mentioned four authors she though I’d like when I first moved up to the adult library: Agatha Christie, Daphne Du Maurier, Mary Stewart and Elizabeth Goudge. I only picked up me first Elizabeth Goudge – The Scent of Water – last year, and when I did I realised that she had been right about all four authors. It was simple story but it was so very well told, with both emotional and spiritual understanding. Her books all seem to be out of print, but I have tracked down copies of the Damerosehay novels that I have heard so much good about, and I found one or two others in a charity shop a while back. Elizabeth Jenkins: I found The Tortoise and the Hare thanks to Virago. I found Harriet thanks to Persephone. I found A Silent Joy and her autobiography, The View from Downshire Hill in the library. I found used copies of Doctor Gully and The Phoenix’ Nest on my travels. I’ve been lucky I know, but I also know that Darlene and Anbolyn both found copies of Brightness and I so want to find one too. And, of course, there are others. 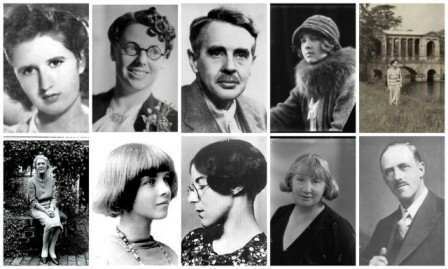 Sylvia Townsend Warner: I first met Sylvia Townsend Warner in a Virago anthology years ago. I forget which anthology and which story, but she stuck in my mind and a picked up Virago’s collection of her short stories. I loved it, and I still think there are few authors who hold a candle to her when it comes to short stories. One fortunate day I found six of her original collections of short stories and a couple of biographies in a second-hand bookshop. I’m looking out for the others, and for her letter and diaries too. G B Stern: A couple of years ago I spotted a book called The Ten Days of Christmas in a second-hand bookshop. I picked it up, because I recognised the name G B Stern as belonging to a Virago author and because I wanted to know why there were ten days of Christmas rather than the more traditional twelve. It looked lovely, and so I bought it. It was lovely, and when I picked up Monogram, a sort of memoir, I really warmed to the author. Since then I’ve picked up The Matriarch and A Deputy Was King in Virago editions and Debonair as an orange numbered Penguin, and I’d love to find more. Francis Brett Young: Last year I spotted a book called White Ladies by Francis Brett Young in the very same second-hand bookshop. I knew the author’s name, because one of his books was in a list of titles readers had suggested to Persephone that Nicola Beauman included in a Persephone newsletter. It looked wonderful, but I couldn’t justify the price – it was a signed first edition. But when I arrived home I checked LibraryThing and I found that Ali and Liz both came from the same part of the country as Francis Brett Young and they loved his books. I found White Ladies in the library’s fiction reserve, and fell in love with rich prose, wonderful characters, and good old-fashioned storytelling. I’ve ordered a couple more books from the library, I’ve picked up a trio of old out of print titles, and I’m hoping to find more. So now tell me, whose books are you hoping to find? Perfect! I’ve been reading everyone else’s lists and realized that I probably couldn’t think of 10 still-writing authors; my list would probably be more like yours. I was thinking the same thing – though I do have some mystery authors who are must-buys (Deborah Crombie for one). I just came across a copy of G.B. Stern’s The Matriarch Chronicles yesterday & thought of you, since you introduced me to her. I’d add Maura Laverty, Dorothy Canfield Fisher, and Charlotte M. Yonge. The hunt for certain authors is part of the fun isn’t it, Jane. I envy you for the Jenkins you’ve read such as Dr Gully which I ridiculously left behind when I bought Brightness. They were something like .75, what would the harm have been if I didn’t like it?! There is a list of authors carried around in my purse, not for me but for my husband. It gets handed to him when we stumble across a second-hand shop so he can start at the opposite end of the alphabet and we meet in the middle. : ) Yes I introduced Liz to Francis Brett Young – and I love the novels of his I have read, I know Liz has enjoyed several too. I have found a few ancient hardbacks of his books fairly inexpensively via abebooks. I really enjoyed White Ladies too. If you get a chance read My Brother Jonathan, This Little World, Far Forest, A Man about the house, and Dr Bradley remembers. I also read one of his novels set in Africa – which I didn’t like quite as much. If it helps you, Edith Olivier’s other novels are nowhere near as good as The Love-Child. I’ve read three others, and they’re mediocre at best – certainly not in the same league as The Love-Child, which is one of my all-time favourites. What a wonderful list! Some of these authors are new to me, but I am with you on Elizabeth Goudge; I’ve carefully collected as many books of hers as I’ve been able to find in library sales and second-hand shops. I love this list! I, too, seek Elizabeth Jenkins’s books, but they seem to be almost impossible to find here in the States. I’ll keep searching, though. Thank you for mentioning Elizabeth Goudge – my library actually has several of her novels (miracle!) and I have just started reading The Bird in the Tree. I love her writing style already.